Top-yield ten Dow-dogs: PG; HD; JPM; WBA; PFE; KO; CVX; XOM; IBM averaged 3.49%. Top 10 S&P: LYB; OXY; HP; ABBV; WMB; M; T; IRM; MAC; CTL averaged 5.90%. These are the Dow VS. S&P Dogs 4/2/2019: Dow top five firms by broker net gains, DIS, BA, GS, UNH, & WBA averaged 20.66%. S&P500 top five, GM; CTL; VLO; TPR; CVS estimated net averaged 33.59% gains. Analyst one-year targets predicted that ten highest yield Dow stocks could produce 36.87% more gain from $5k invested in the lowest-priced five than from $5k in all ten. The S&P prediction showed 6.34% LESS net-gain for the little dog five than from $5k invested in all ten. One of five top dividend-yielding Dow dogs were verified as being among the top ten gainers for the coming year based on analyst 1-year target prices. (It is tinted gray in the chart below). So, our April 2 yield-based forecast for Dow dogs, as graded by Wall St. wizards, was 20% accurate. Walgreens Boots Alliance (WBA) netted $325.98 based on a target price estimate from twenty-five analysts, plus dividends, less broker fees. The Beta number showed this estimate subject to volatility 102% more than the market as a whole. UnitedHealth Group Inc (DWDP) was projected to net $255.91, based on the median of target estimates from twenty-five analysts, plus dividends, less broker fees. The Beta number showed this estimate subject to volatility 21% less than the market as a whole. Goldman Sachs Group Inc (GS) was projected to net $173.29, based on dividends, plus the median of target price estimates from twenty-eight analysts, less broker fees. The Beta number showed this estimate subject to volatility 22% more than the market as a whole. Boeing Co (WBA) was projected to net $140.33, based on dividends, plus the median of target price estimates from twenty-three analysts, less broker fees. The Beta number showed this estimate subject to volatility 33% more than the market as a whole. Walt Disney Co (DIS) was forecast to net $137.37, based on target price estimates from twenty-five analysts, plus annual dividend, less broker fees. The Beta number showed this estimate subject to volatility 9% less than the market as a whole. The average net gain in dividend and price was estimated at 20.66% on $5k invested as $1k in each of these five Dow stocks. This gain estimate was subject to average volatility 25% over the market as a whole. One of five top S&P 500 dividend stocks by yield were among the top ten gainers for the coming year based on analyst 1-year target prices. (It is tinted gray in the chart below). Thus, this yield-based forecast for S&P 500 dogs was graded by Wall St. Wizards as 20% accurate. CVS Health Corp (CVS) was projected to net $513.12, based on a median of target price estimates from twenty-six analysts, plus the estimated annual dividend, less broker fees. The Beta number showed this estimate subject to volatility 6% less than the market as a whole. Tapestry Inc (TPR) was projected to net $327.24, based on dividends, plus a mean target price estimate from twenty-three analysts, less broker fees. The Beta number showed this estimate subject to volatility 38% less the market as a whole. Valero Energy Corp (VLO) was projected to net $29491, based on a median target estimates from twenty analysts, plus dividends, less broker fees. The Beta number showed this estimate subject to volatility 17% more than the market as a whole. CenturyLink Inc (CTL) was projected to net $276.07, based on a median of target price estimates from sixteen analysts, plus dividends, less broker fees. The Beta number showed this estimate subject to volatility 23% less than the market as a whole. General Motors Co (GM) was projected to net $267.97 based on dividends, plus a median target estimate from twenty-two brokers, less transaction fees. The Beta number showed this estimate subject to volatility 27% more than the market as a whole. The average net gain in dividend and price was estimated at 33.59% on $5k invested as $1k in each of these five stocks. These gain estimates were subject to average volatility 3% less than the market as a whole. Stocks earned the "dog" moniker by exhibiting three traits: (1) paying reliable, repeating dividends, (2) their prices fell to where (3) yield (dividend/price) grew higher than their peers. Thus, the highest yielding stocks in any collection became known as "dogs." More precisely, these are, in fact, best called, "underdogs". Top ten Dow dogs as of 4/2/19 by YCharts represented seven of eleven Morningstar sectors. Top yielding stock, International Business Machines Corp (IBM)  was the lone technology sector representative in the top ten. Second place saw the lone communication services firm, Verizon Communications (VZ) . Third place went to the first of two energy firms, Exxon Mobil (XOM) [2 ]and the other energy firm placed fourth, Chevron Corp (CVX) . One of three consumer defensive reps placed fifth, Coca Cola (KO) , and there were two more in seventh and tenth places, Walgreens Boots Alliance Inc (WBA) , and Procter & Gamble Co (PG0 . In sixth was healthcare firm, Pfizer (PFE) , and in eighth place JPMorgan Chase (JPM)  was the lone financial services Dow representative. Finally a consumer cyclical representative placed ninth, The Home Depot Inc (HD)  to compete the Dow top ten by yield. 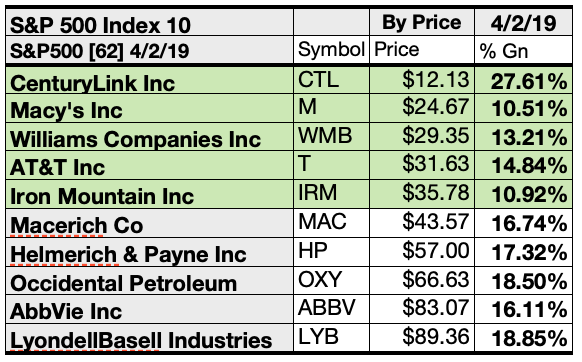 Top ten S&P 500 stocks selected 4/2/19 by yield also represented seven of eleven Morningstar sectors. First place was claimed by a one of two communication services sector representatives, CenturyLink Inc. (CTL) . The other placed fourth, AT&T Inc (T) . In second place was the lone real estate sector representative, Macerich Co (MAC) . Third plce was taken by a lone industrials sector rep, Iron Mountain Inc (IRM) . One from the consumer cyclical sector placed fifth, Macy's Inc (M) . The first of three energy firms placed sixth, Williams Companies Inc (WMB) . The other two placed eighth and ninth, Helmerich & Payne Inc (HP) , and Occidental Petroleum Corp (OXY) . In seventh place, was a healthcare representative, Invesco Ltd (IVZ) . Finally, in tenth place the basic materials stalwart, LyondellBasell Industries NV (LYB)  to complete the S&P 500 top ten by yield for April. Top ten Dow dogs show an overbought condition (in which aggregate single share price of the ten exceeds projected annual dividend from $10k invested as $1k each in those ten). 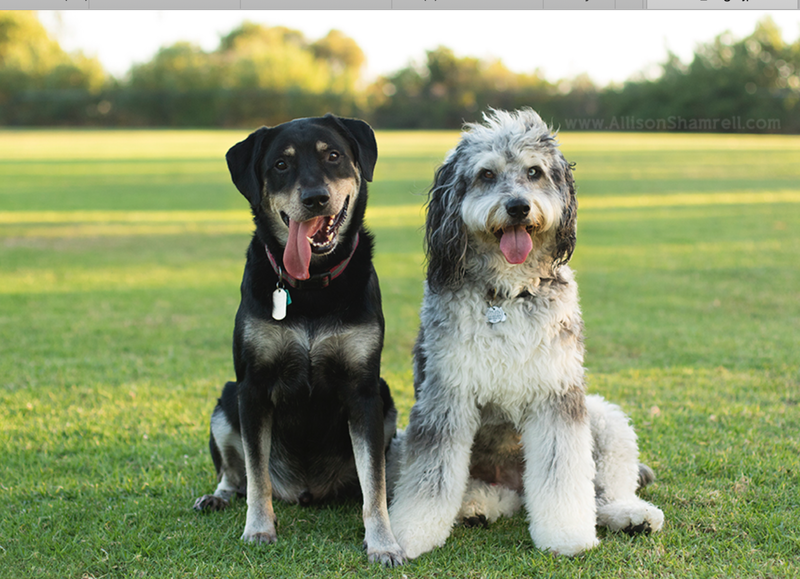 A dividend dogcatcher priority is to source stocks whose dividends from $1K invested exceed their single share price. In the Dow 30 Index, no Dow stock any longer meets that goal. However, six S&P500 Dogs are well priced more than 10% below the dividend scored from $1,000.00 invested. They are, CenturyLink (CTL); Macerich Co, (MAC); Iron Mountain (IRM); AT&T (T); Macy's (M); Williams Companies, Inc. (WMB). The aggregate single share price for the top ten Dow dogs was 73% per YCharts and 45% for the S&P 500 top ten while the dividend derived from $10k invested as $1k in each of the ten was 27% from the Dow ten, and 55% from the S&P500 ten. This gap between high share price and low dividend per $1k (or oversold condition) means, no matter which chart you read, the Dow are low risk and low opportunity Dow dogs. The Dow top ten average price per dollar of annual dividend for April 2, 2019 was $28.93, while the S&P500 top ten average price per dividend dollar was $18.37, a $10.56 spread. Ten top Dow dogs were culled by yield for this update. Yield (dividend/price) results as verified by YCharts did the ranking. As noted above, top ten Dow dogs selected 4/2/19 revealing the highest dividend yields represented seven of the eleven sectors in Y-Charts reckonings. $5000 invested as $1k in each of the five lowest-priced stocks in the top ten Dow Dividend kennel by yield were predicted by analyst 1-year targets to deliver 36.87% more gain than from $5,000 invested in all ten. The third lowest priced Dow top yield dog, Walgreens Boots Alliance Inc (WBA), was projected to deliver the best net gain of 32.6%. The five lowest-priced Dow top-yield dogs for April 2 were: Pfizer (PFE); Coca-Cola (KO); Walgreens Boots Alliance Inc (WBA); Verizon Communications (VZ); Exxon Mobil (XOM), with prices ranging from $42.91 to $81.38. 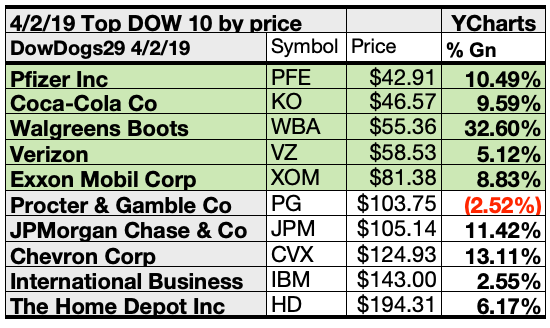 Five higher-priced Dow dogs for April 2 were: Procter & Gamble Co (PG); JPMorgan Chase & Co (JPM); Chevron (CVX); International Business Machines (IBM); The Home Depot Inc (HD), whose prices ranged from $103.75 to $194.31. Ten top S&P 500 dividend dogs were culled by yield for this update. Yield (dividend / price) results verified by YCharts did the ranking. As noted above, top ten S&P 500 dividend dogs selected 4/2/19 showing the highest dividend yields represented seven of eleven in the Morningstar sector scheme. $5000 invested as $1k in each of the five lowest-priced stocks in the top ten Dividend S&P 500 kennel by yield were predicted by analyst 1-year targets to deliver 6.34% LESS gain than $5,000 invested as $.5k in all ten. The very lowest priced selection, CenturyLink Inc (CTL), was projected to deliver the best net gain of 27.61%. The five lowest-priced top-yield S&P 500 dividend dogs as of April 2 were: CenturyLink Inc (CTL), Macy's Inc (M); Williams Companies Inc (WMB); AT&T Inc (T); Iron Mountain Inc (IRM), with prices ranging from $12.13 to $35.78. Five higher-priced S&P 500 dividend dogs as of March 28 were: Macerich Co. (MAC); Helmerich & Payne Inc (HP); Occidental Petroleum Corp (OXY); AbbVie Inc (ABBV); LyondellBasell Industries NV (LYB), whose prices ranged from $43.57 to $89.36. Stocks listed above were suggested only as possible reference points for your Dow dividend dog stock purchase or sale research process. These were not recommendations. Click here to subscribe to The Dividend Dogcatcher & get more information. Catch A Dog On Facebook At 8:45 AM every NYSE trade day on Facebook/Dividend Dog Catcher, A Fredrik Arnold live video highlights a portfolio candidate in the Underdog Daily Dividend Show! Disclosure: I am/we are long T, CSCO, INTC, PFE. I wrote this article myself, and it expresses my own opinions. I am not receiving compensation for it (other than from Seeking Alpha). I have no business relationship with any company whose stock is mentioned in this article.